For this month’s Kitchen Reader book club (get more info here if you’d like to join!) we had a choice of two books: either Eat Where You Live: How to Find and Enjoy Fantastic Local and Sustainable Food No Matter Where You Live by Lou Bendrick or Just Food: Where Locavores Get it Wrong and How We Can Truly Eat Responsibly by James E McWilliams (chosen by Julie of Savvy Eats). Although I was leaning at first towards Just Food, after reading the reviews on Amazon it seemed like this book might frustrate more than enlighten me so I opted for the much shorter, lighter read, Eat Where You Live. If you are brand new to the concept of eating local and interested but intimidated by the concept, then this is a good primer. But it’s just that: a very basic primer. In an effort to address all aspects of eating local, Bendrick includes chapters on sustainable seafood, foraging, preserving, growing your own, as well as drinking local and bringing the local ethos to dining out. But the book is so short (it took me two hours to read, and I’m a slow reader) that each section really only offers a cursory look. If you are really interested in foraging you’ll have to do more research (she is careful to say to go with someone who is trained, especially when mushroom hunting, which can be fatal). For preserving she makes canning and pickling out to be the most time consuming process on the planet and opts instead for freezing, dry storage, and dehydration. There’s nothing wrong with these methods, but I don’t think canning and pickling are as labor intensive as she lets on. I love freezing, but I just don’t have the room (here we go, back to city living) to have a huge extra freezer. Same with the dry storage. Would I love to have a root cellar? Sure. But it’s not realistic. For those who do have this capability, however, Bendrick provides some nice charts with proper temperatures to store various vegetables and ways to prep foods before freezing. I was happy that Bendrick brought the local conversation beyond just meat and produce to fish, beverages, and eating out in restaurants. She rightly predicted that local spirits would be the next big thing, and sure enough they are popping up everywhere. Same with local microbrews. Bendrick suggests being mindful of eating at restaurants that support local farms and use local produce. Even the most die hard locavores may let down their guard outside the house. Although I was pleased that Bendrick addressed the fact that eating local can be a challenge for many, her coverage of the topic ultimately disappointed me. Her assumption is that those are not the people who are reading this book. Rather, she assumes her audience is made up of privileged people who can help those poor folks out there who don’t know any better and can’t afford to eat local (or eat at all). She suggests making a donation of time or money to a food pantry or soup kitchen, donating a csa share to a hungry family, starting a community garden, and eating less meat (which she argues will help solve world hunger because meat uses up so many resources). These are all wonderful ideas but there are no suggestions here for people living in food deserts (areas where healthy, affordable food options are unavailable) or who might think that eating local and healthy is more expensive than eating junk food. For a really fabulous article on this topic, read mark Bittman’s NY Times editorial “Is Junk Food Really Cheaper?” So again, I found that Bendrick’s book did not come to the rescue of those who truly need help and resources to eat local. I don’t want to be all negative. Bendrick has compiled a great list of resources that are sprinkled throughout and offers a wonderful glossary of food terms in the back. Her tone is realistic and approachable, urging people to be more mindful while acknowledging that “Sometimes I just want a Snickers bar.” But at just two years old, this book is already a little behind the times. Her biggest piece of advise is basically to use the internet to find resources, and the truth is that mainstream food media has really picked up on the whole local/sustainable thing and most food savvy people are aware of the choices she lays out. So if you really and truly don’t know where to begin with this whole eating local business, pick up Eat Where You Live: How to Find and Enjoy Fantastic Local and Sustainable Food No Matter Where You Live. Otherwise I would recommend a more in-depth book. I am a member of a CSA, plus we have a mini-farmer’s market at work, so I try to do as much of my shopping for ingredients locally. The produce tastes so much better, too! Thanks Kiri! 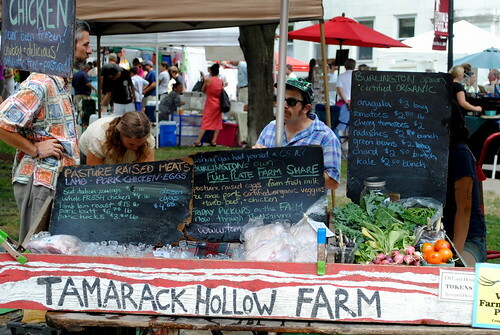 I have always wanted to join a CSA and we plan to as soon as we move back to New York. Wow…am I glad I clicked on this. I tend to pass over book reviews, but since I’m more interested in how I can eat locally as far as our living situation allows, this drew me in. I guess the book isn’t for me either. I live in a rural area and have a yard. That helps a lot in the summer but not at all in the winter. Because of our ruralness, we have one decent farmers’ market, which is an hour away and a few very measly little ones that pretty much close down in winter. No local produce to be found. Thanks for sharing your thoughts on the book. They helped a lot. Thanks for an honest and thorough review of an interesting book. Very nice review..It is also very interesting! You wrote it so well! Oh wow, that is far! I always wanted to join one in New York as well but the pick-up times and locations never worked for me. I want to try again when we move back. Thank you Nandita, I’m glad you enjoyed it! Thanks Theresa! Yeah, I think you’re a little advanced for this book! She totally respects canning and people who can, but says that “for the average person these methods are too time consuming and involved” (referring to canning, curing, smoking, and pickling). She also says that she is afraid of “fatally poisoning your loved ones” with canning, which I thought was a little dramatic. Very good review – i love farmers markets and if there were available all year around i would go to them. Here in the stores they have signs that say if they are locally grown or not. I always get the local stuff. Thank you Ewa! Yes, eating local does get trickier in the winter! It’s great that grocery stores are now starting to label whether it is local or not. You raise a lot of interesting points. Does Bendrick talk about why local eating is beneficial? I don’t want to sound ignorant, but my eyes were really opened by reading Just Food, the other book pick this month. It was definitely heavy going at times (and I’m not finished it yet), but it presents a very in-depth look at the local food movement. I have learned that local is not necessarily better than other food. I was a bit shocked by what I learned but also feel as though it’s good to look at the issue more carefully. There are a lot more nuances to ethical food than just how far it has travelled. Did you come away with any new resolves after reading this book? Bendrick does give some nice explanation of why eating local is great at the beginning of the book, using local eggs as the example. She says they are “fun” (because she goes to the farm with her daughter to get them), healthier (higher in omega-3 and other goodies while lower in cholesterol than commercial eggs, plus she’s not as concerned about salmonella from them and the conditions are often better for the animals. She also makes the point that buying local will support your local farmer instead of corporations, so she says it builds community. She sites the lower carbon footprint and the fact that while sometimes local can be a bit more expensive “cheaper” food often has hidden costs to your health and the health of the planet. Mostly she says local just tastes better. I was really curious about Just Food so I can’t wait to read your review! I was intrigued by it’s close look at all of this since I tend to get skeptical as soon as anything becomes a trend. I always feel that when that happens things get diluted, exaggerated, etc. and it becomes harder to tell the truth from PR. Living in Israel has been amazing since most of our food is local (the country is smaller than New Jersey and produces amazing stuff) and almost everything is seasonal (lime season is over, and you won’t find a single lime in Israel right now). When I move back to New York I definitely want to join a CSA. Hi Katherine, Thanks for your honest review of this book. 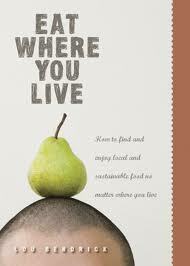 I haven’t read the book, but your comments are spot on in terms of the challenges of broadening local eating beyond those lucky enough to live in areas where fresh, local ingredients are available and affordable to us. I’m happy that people are writing these books, because a spotlight on the subject at least illuminates the topic and hopefully will help generate greater awareness of the possibility and obstacles that exist for more local eating. Thanks for your thoughtful comment Lori! I’m also happy that books like this are being written, and I hope the subject continues to gain more exposure and coverage. It seems that slowly people all over the country are really starting to consider what and how they eat, and how it impacts not only themselves but the world. Katherine, Love this book club you are a part of and introduction to books I don’t know about. Enjoying your writing as always!! I love organics but wish for labeling and standards of disclosure to be stiffer for sure, so we get what we pay for or growers stand behind their organic claims. Great review, thanks. I’m big into local, sustainable etc, but I also really like buying locally manufactured food goods (not everyone is lucky enough to have this opportunity). I live in St. Louis which has a rich ethnic heritage. Some of the Italian restaurants here are good (not Northern Italian; more red sauce). And you can find jarred pasta sauce in the supermarket from some of these restaurants! A great convenience product that’s also quite tasty. OK off topic, but kinda interesting. Anyway, thanks for the review. Thank you! That is so great that you have locally manufactured food as well as access to local produce, etc. Now that I think about it we have that in Israel as well. Maybe not in the supermarkets, but in the shuks many people make their own condiments that they sell (from pesto to harissa to garlic paste to tabbouleh) that are great. The next frontier of local? I knew you are a great writer, but when you do the book review I can totally tell why you are the writer… what a great book review. I love your honesty and looking at the book from different angle. It gives me perspectives outside of the book and you are right about them. Your great review only make me want to hear about other books and your reviews Katherine. Keep continuing. I enjoy this a lot! Great review Katherine. I’d be really interested to read that book now! Thank you Lorraine! Although I found it to be very basic it is also a good, short read – it took me about two hours and I’m a pretty slow reader! What a well-written, thoughtful book review, Katherine. I appreciate you sharing your views on it and I agree with your cautious approach to the organic label. Thank you Hannah! Yes, organic is a great concept I just try not to blindly accept it. Katherine, I really enjoyed this review. In Perú we are used to locally, seasonal produce, with the occasional import, like Chilean grapes or salmon, for example. I´m trying to feed myself locally in Northern Virginia, don´t have a yard and I´m not interested in canning, but I understand how crazy it is to look for watermelons in December (in the US, that is. December is watermelons season in Perú). 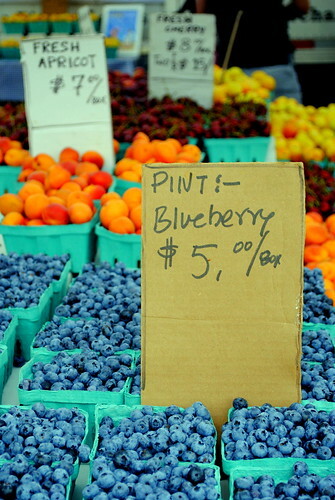 Actually, I´m having fun with the fruits and veggies that I can buy at Whole Foods or at farmers markets, and that keep changing with the seasons. Maybe it´s easier for me because I´m used to it. Finally, I don´t trust every organic label in the market…sorry. Thanks again for the great review. Thank you, I am so glad! I think being used to it is a big part of being able to eat seasonally. When you grow up eating whatever you want any time of year you have to take a step back and be more mindful when trying to eat seasonally. I live in Israel right now where it is very seasonal with few imports as well. I’m loving it. That is great that you have brought your seasonal ethos to Virginia! I also don’t trust every (or even most) organic labels in the market!